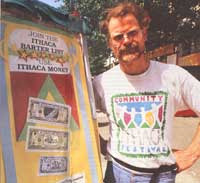 Started in 1991, the Ithaca HOUR is the largest and oldest local currency system still operating in the United States. MOTHER talks with Paul Glover, the system's founder. "Tough times, it seems, have been with us for years. Many of us have been hit pretty hard. That's why Paul Glover, a resident of Ithaca, New York, decided to do something about it. Two years ago he came up with a supplemental currency called HOURS, and here's how it works. Each HOUR is equivalent to one hour of time, or $10, which is the local county's average hourly wage. Also available are 1/4 HOURS ($2.50), 1/2 HOURS ($5), and 2 HOURS ($20), all printed from a small shop in town. You can buy all the goods and services you need just like you can with the U.S. dollar. You can even use HOURS to go to the movies or to enjoy some fine dining. The best news and worst news about Paul's HOURS is the fact that they are worthless outside of Ithaca. As a result, they circulate within the community, improving the city's economic flow and encouraging participants to put their faith in each other rather than the almighty dollar. As the Ithaca HOUR plainly states, "In Ithaca We Trust." Anyone can participate. For one dollar, residents become members and receive four HOURS automatically. Ithaca Money , the local newspaper established and published by Paul, lists all of the members, their phone numbers, and the services or goods they are either offering or seeking. If, say, Ellen needs a carpenter and sees John's carpentry listing, she'll call him and they'll negotiate the amount of HOURS he'll be paid. When John's done, he may take his hard-earned HOURS and purchase a few evenings of baby-sitting time from Susan. With over 700 goods and services to choose from, there are few necessities that members won't find. Excited to see it for ourselves, MOTHER staffers headed up to Ithaca to witness the exchange system firsthand. After just one weekend we found that, although some kinks still need to be worked out, the currency is quite impressive overall. We saw, for example, a hotel manager take in six HOURS from a couple, which he in turn used to pay a landscaper. We watched a restaurateur use the HOURS he earned from customers on Friday night to purchase fresh produce at Saturday's Farmer's Market. We even whiled away the HOURS ourselves, using the four HOURS Paul sold us to negotiate for three loaves of fresh bread, honey, cider, and a beautifully handcrafted wooden cutting board. Mostly what we saw in Ithaca were dozens of community members who addressed each other by first name, joked around, and negotiated for each other's goods and skills. Not a bad weekend.